In recent years, the “comprehensive internationalization” of higher education institutions has been the primary focus of leaders in international higher education. By integrating an international dimension into teaching, research, and outreach, we have sought to transform higher education institutions into global institutions. We are now reaching a new era in this process where many institutions have embraced internationalization. At the same time, there are still many institutions where rhetoric regarding a global dimension still outweighs vision, strategy, and action. Further, internationalization as we know it today has inherent implications which are not always viewed as positive including brain drain, academic imperialism, and the commodification of higher education. Additionally, the current process of “comprehensive internationalization” no longer represents the full scope and development of international initiatives today that are transforming our institutions and the world. Therefore, a more effective approach may be to shift the focus from “internationalizing” higher education as a process applied to institutions to instead re-imagining and re-visioning higher education in a globalized world. Every single person and location today is impacted by actions of those in other parts of the world. Higher education plays a critical role in understanding and shaping those interactions and events. This shift in viewing higher education as adapting to a global setting changes the role of senior international officers who no longer apply a process but lead approaches at their institutions to meet the needs and interests of globally mobile students and faculty more broadly, as well as to advance their institutions’ missions in a global context. This also entails responding to the needs of the world at large such as through development, capacity building and addressing collectively the pressing issues of the 21st century including poverty, health, and a sustainable environment. 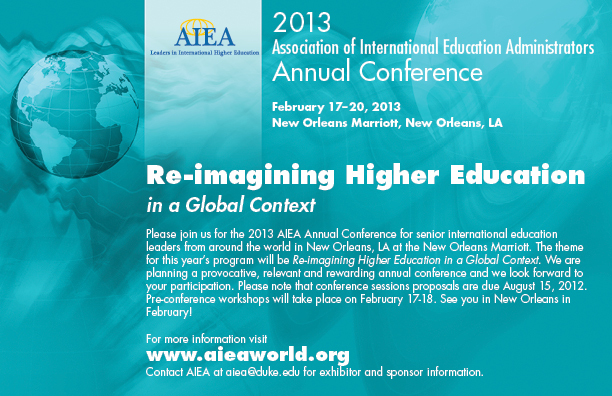 Please join us for the 2013 AIEA Annual Conference in New Orleans to re-imagine higher education in a global context, moving beyond internationalization as an institutional process to adapting higher education to a globalized world. Conference presenters will not receive any financial recompense for their participation. Moreover, travel costs, accommodation and registration fees should be paid for by the conference presenters. Conference participants are recommended to request additional funding from the institution they represent, as well as through regional or state organizations. The call for proposals process has been completed. Conference Registratoin is now closed. Full conference registration includes name badge, conference materials, all conference sessions, opening plenary, 2 evening receptions, 1 breakfast, 2 luncheons, admission to the exhibit hall, and coffee breaks. NOTE: Pre-conference workshops are an additional, separate charge from the conference registration fee. Registration fees are refundable, less a $75 processing fee, up until January 13. No refund will be issued for cancellations starting January 14, 2013. Registrations are transferable until January 13 with a $50 administrative transfer fee. Starting January 14, transfers will not be accepted. AIEA is not responsible for problems beyond our control such as weather conditions, campus conditions, travel difficulties, health issues, etc. No refunds will be given in these situations if occurring after January 13. The 2013 conference took place February 17-20 at the New Orleans Marriott Hotel in New Orleans, LA, USA. Hans de Wit is Director of the Centre for Higher Education Internationalization (CHEI) at the Università Cattolica del Sacro Cuore in Milan, Italy, and Professor of Internationalization of Higher Education at the Amsterdam University of Applied Sciences. He is the co-editor of the Journal of Studies in International Education (SAGE/ASIE) and The SAGE Handbook of International Higher Education. He has published widely on internationalization and is a consultant for organizations such as the OECD. Eric Liu is an author, educator, and civic entrepreneur. Eric is founder of the Guiding Lights Network, which promotes and teaches the art of creative citizenship. His books include the national bestsellers The Gardens of Democracy and The True Patriot, both co-authored with Nick Hanauer; The Accidental Asian, a New York Times Notable Book; Guiding Lights, the Official Book of National Mentoring Month; and Imagination First, co-authored with Scott Noppe-Brandon of the Lincoln Center Institute. Eric served as a White House speechwriter for President Bill Clinton and later as the President's deputy domestic policy adviser. After the White House, he was an executive at the digital media company RealNetworks. A graduate of Yale College and Harvard Law School, he lives in Seattle where he teaches at the University of Washington and serves on numerous nonprofit and civic boards. 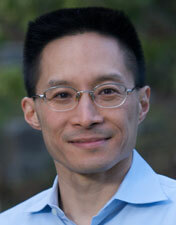 A regular columnist for TIME.com, Eric can be found on Twitter @ericpliu. For information, please contact Scott Aughenbaugh at 202.775.3157 or [email protected] or visit www.csis.org. The Center for Strategic & International Studies (CSIS) aims to address and analyze the key policy questions that governments, corporations, nongovernmental organizations and other leaders face in the realm of international affairs, transnational challenges, as well as defense and security. Seven Revolutions captures these findings in an exciting, fast-paced, multimedia presentation that has been given around the world in an effort to promote strategic thinking about the long-term trends out to 2030 and beyond. The research is constantly evolving in order to reflect the most recent trends in population, resource management, technology, information and knowledge, economics, security and governance. Michèle Ledgerwood is a Senior Associate with the Center for Strategic and International Studies (CSIS) and a speaker in the Abshire-Inamori Leadership Academy's (AILA) Seven Revolutions lecture series. She is also affiliated with both the Transnational Threats program and the Global Health Policy Center at CSIS. Mrs. Ledgerwood has 25 years of experience in the United States and Europe. She has directed several multidisciplinary research programs and working groups for government and private sector clients, with a focus on infectious diseases and pandemics, emerging science and technology, biosurveillance, trusted networks, and global trends in biotech. For more than 12 years, she was the Senior Analyst for the US Department of Defense's (DoD) influential Highlands Forum. She also has served as a Senior Analyst and Program Manager at Science Applications International Corporation (SAIC), as a pro bono advisor to the not-for-profit InSTEDD (Innovative Support to Emergencies, Diseases and Disasters), and as a freelance writer for the United States Institute of Peace (USIP). Mrs. Ledgerwood has authored publications on topics including global cyber threats, US laboratory capacity, complex humanitarian emergency response models, and US Government scientific research. She is a regular speaker on the uses of social media in public health. She also advises early-stage mobile technology startups on public sector partnerships and networking strategies. Earlier in her career, Mrs. Ledgerwood worked for two European consulting firms and supported groundbreaking research at the Stanford University School of Medicine's Section on Medical Informatics. She holds degrees from Stanford University and the Harvard Kennedy School. She has traveled to 40 US States and more than 50 foreign countries, and speaks six languages with varying degrees of proficiency. 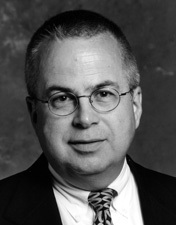 George L. Mehaffy has served for 12 years as the Vice President for Academic Leadership and Change at the American Association of State Colleges and Universities (AASCU) in Washington, D.C., a higher education association representing 400 public colleges and universities and their 3.8 million students. His division is responsible for developing and managing programs for member institutions in areas such as organizational change, civic engagement, leadership development, undergraduate education, technology, international education and teacher education. He works closely with university presidents and chief academic officers on a variety of national initiatives. Each year, his division organizes a number of conferences, including two national conferences each year for AASCU chief academic officers. He has directed a series of innovative projects, including international programs with China and Liberia; a technology transformation annual conference with EDUCAUSE and the University of Central Florida; and two major national studies of student success. In 2003, he launched the American Democracy Project, a civic engagement initiative involving 240 colleges and universities, in partnership with The New York Times. Most recently, he organized the Red Balloon Project, a national initiative to transform undergraduate education. Before coming to AASCU, he had more than twenty years of teaching and administrative experience in higher education in Texas, New Mexico, and California. Please click one of the three links below for a complete download of all of 2013's conference materials. How Do We Know that Sending Staff Abroad is Advancing Internationalization? Registration is now closed. Many thanks to all who attended. The American Council on Education (ACE) and Association of International Education Administrators (AIEA) announce the 13th meeting of the Internationalization Collaborative, a network of campus leaders that convenes annually to address critical issues in campus internationalization. The program is designed for campus leaders with responsibility for internationalization, including senior international officers, provosts, deans, department chairs, and program directors. A team of campus leaders from the same institution is ideal. The 2013 Collaborative will focus on building strong connections between international strategy and broad institutional goals. The topic will be framed by a panel of college presidents who will describe how they have developed institutional goals on their campuses. Participants will have opportunities to discuss this topic through plenary sessions, small group discussion, and on-line dialogue before and after the meeting. The Collaborative is part of a strategic partnership between ACE and AIEA. The two organizations share the goal of developing strong campus leaders who can guide their institutions through the challenges of internationalization. The Collaborative is designed to complement the sessions of the AIEA Annual Conference by giving its participants the opportunity to delve deeply into a timely, critical issue. The registration fee for the ACE / AIEA Internationalization Collaborative is $250. On-line registration is only available through the ACE website. This workshop focuses on how to develop strategic and sustainable international partnerships, providing in-depth models from Brazil, India, China, and Indonesia. Expert panelists will use their combined wealth of experience building partnerships with these four countries to provide audience members with practical knowledge, lessons learned, and best practices for collaborating with four of the most dynamic and promising partner countries. In addition to highlighting the unique nature of developing partnerships with each of these countries, the workshop will also expand on notable synergies that participants will be able to apply to their partnership endeavors with all four countries and others. Building Strategic Partnerships with Brazil, India, China, and Indonesia: Synergies and Divergences; Strategic Planning and Garnering Support from Campus Stakeholders: Examples from Brazil, China, and India; Breaking the Mold: New Models in International Partnerships; Best Practices for Engaging with Brazil, India, China, and Indonesia; and How International Partnerships Advance Government Goals. Clare Banks is Senior Manager of the Center for International Partnerships at the Institute of International Education. In her current role, Ms. Banks coordinates a number of programs focused on building sustainable partnerships among higher education institutions around the world. These include: the International Academic Partnership Program, the US-Indonesia Partnership Program and the Global Partnership Service. Ms. Banks holds a BA from Georgetown University and an MA from New York University. Daniel Obst is Deputy Vice President of International Partnerships at the Institute of International Education (IIE) in New York. Mr. Obst oversees all the activities of IIE’s network of 1,100 member institutions, IIE’s publications and higher education services, IIE’s Center for International Partnerships in Higher Education, and IIE’s communications and digital strategy. Mr. Obst received his B.A. in International Relations from the George Washington University and holds a Master's degree in European Studies from the London School of Economics. This workshop continues the discussion of successful leadership and management during university transition towards total campus internationalization and global engagement by highlighting the current trends and challenges faced by SIOs. Experienced SIOs will discuss identifying, serving and leveraging your campus constituents and overseas partners, developing creative resource solutions, and institutional compliance. This workshop is designed for SIOs who have served in an international education leadership role for at least 2-3 years. Strongly recommended is at least 2-3 years leadership experience in higher education. Associate Provost for International Programs and Professor of German language and literature at Kalamazoo College. Chair SECUSSA, NAFSA:AIE (2000-2001); member founding board of the Forum, member executive committee of the Association of International Education Administrators (AIEA); member International Education Leadership KC NAFSA: AIEA. Currently chair Ethics working group of the Forum on Education Abroad. Published and presented on topics in education abroad, international programs administration; campus internationalization, and legal and risk management issues in education abroad. is Vice President for Strategic Partnerships at CEA Study Abroad. He served as SIO at University of Missouri-Columbia and Old Dominion University (VA). Heyl is former president of AIEA (2000-2001) and author of The Senior International Officer (SIO) as Change Agent (AIEA, 2007) and co-editor of The SAGE Handbook of International Higher Education (2012). He holds a B.A. from Stanford University and a doctorate in European history from Washington University-St. Louis. is Assistant Vice Chancellor, International Affairs, University of Colorado Denver. Dr. North has worked in international affairs for nearly 25 years and has extensive experiences with international start-up initiatives at public and private institutions including comprehensive, liberal arts and research universities. At CU Denver, she holds a comprehensive international portfolio including international admissions, ESL, international student and scholar services, global education, international colleges and partnerships, international risk management, international enterprise development, global health and international planning. Dr. North holds an MA (Econ) in Social Anthropology from the University of Manchester, U.K. and an M.A. and Ph.D. in Cultural Anthropology from Princeton University. As institutions of higher education around the world strengthen their internationalization strategies, the impact of those actions has global implications. This workshop will explore two elements of internationalization with clear global consequences - foreign student recruitment and enrollment and trans-national education. These activities include a myriad of global approaches and are often initiated in developed countries and take place in the developing world. While there is no doubt that cross-border educational opportunities are helping developing countries with unmet skill agendas, knowledge economy growth and economic prosperity, what is the responsibility of higher education institutions in operating on a global scale? What are the responsibilities of institutions looking increasingly to overseas markets for student recruitment? What elements need to be considered as institutions grow their global brand by establishing off shore campuses and joint/dual degree programs in other parts of the world? What are the academic, social, economic and diplomatic objectives and practices that need to be considered? What should colleges and universities do to avoid or mitigate any unintended adverse consequences of internationalization? These are some of the major questions around the global responsibility of international higher education that will be discussed in this workshop. Based at the British Council in Hong Kong, Elizabeth leads the British Councils global commercial research team, Education Intelligence. Prior to this she worked for the British Council in Washington DC, as Higher Education manager, managing the delivery of the UK – US New Partnership Fund and bilateral policy forum. Elizabeth joined the British Council in 2006 as part of the Education Market Intelligence team producing research for the UK Higher Education sector. She now leads the Higher Education market research team, Education Intelligence, that are responsible for delivering research services to the UK and global sectors with a focus on forecasting international student mobility, exploring international student decision-making, and global higher education trends. Few countries have seen such rapid economic and educational change in so short a time period as China. China has been the top place of origin sending students to the United States since 2010. The number of Americans studying abroad in China increased by over 500% in the past ten years, making China one of the top 10 study abroad destination countries for U.S. students. President Obama’s 100,000 Strong Initiative in 2010 seeks to dramatically increasing the number of American students studying in China. Public and private institutions have in many cases undertaken major initiatives to meet the emerging demand for student mobility on a larger scale. The past decade has witnessed various institutional practices in expanding student mobility, but has also seen the rigorous challenge and rising risks. The session will introduce the overall context of China’s international higher education, review some of the practices in institutional cooperation and explore the possibility of finding productive and quality assured solutions to overcome the obstacles. It will help the US institutions learn and understand the China’s international higher education, identify and select appropriate partner institutions, create and manage legal and quality programs and to establish a sustainable strategic international partnership with Chinese institutions. The workshop is designed for leaders in US institutions interested in developing linkages with Chinese institutions. Attendees are invited to participate by bringing problems, lessons learned, and successful practice of their institutions. Weimin Che is Assistant Director General and Director of the Division of International Cooperation, Chinese Service Center for Scholarly Exchange (CSCSE), a national non-profit organization affiliated with the Ministry of Education, P.R.China. CSCSE now has over 200 professional staff that offer one-stop services in study abroad, study in China and institutional cooperation. Mr. Che joined CSCSE in 1989 and assumed the role of Assistant Director General in 2012. He is now the Director-in-Charge of international programs and institutional cooperation. He has years of experience in overseas qualifications evaluation administration and quality assurance of trans-national education. From 1994-1998, Mr. Che worked as Vice Consul, Education Section, the Consulate General of the People's Republic of China in Vancouver. He received postgraduate education in the United Kingdom and holds a master’s degree. Linhan Chen is Assistant President, Guangdong University of Foreign Studies, P.R.China, directing the international programs. His prior administrative positions include Head of the Department of Applied English, Vice Dean of the School of English for International Business and Dean of the International College. Mr. Chen received his masters’ degree at the University of Bristol, UK and now is a PhD candidate at Coventry University, UK. His areas of expertise are English teaching and internationalization of higher education. Dr. Liu assumed the role of Associate Provost for International Initiatives, Georgia State University, in 2011. 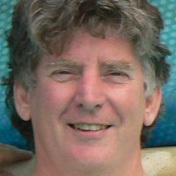 He was formerly on the faculty of the Department of English at the University of Arizona from 1998. In 2007, he became head of the department and Director of the Confucius Institute, and has also served as Assistant Vice Provost for global initiatives at Arizona. Dr. Liu also served as the founding Executive Director of the English Language Center at Shantou University in Guangdong, China from 2004-2008. He is additionally a senior advisor for the Office of Chinese Language Council International (Hanban) and the Vice President of the International Society of Chinese Language Teaching. He is a nationally recognized leader in the teaching of English to speakers of other languages as well as the teaching of Chinese to speakers of other languages. Dr. Liu has an extensive background in garnering external funding, research and publications. Yenbo Wu is Associate Vice President and Director of International Programs for San Francisco State University. He directs the Office of International Programs, which provides campus-wide leadership and coordination in implementing the University's goals for international education and exchange. It works closely with faculty, staff, students, scholars, the local community, and international alumni in supporting initiatives to internationalize the campus. Dr. Wu received his Ph.D. degree in Comparative and International Education from State University of New York, Buffalo. His areas of expertise include international education, cross-cultural communication, Chinese cultural education programs and comparative education and second-language acquisition. This workshop is principally for conference attendees from outside the US. It is an interactive workshop exploring the widening motivations for a more comprehensive international engagement of U.S. institutions, as well as implications for partnership building. The workshop will identify features of the US higher education system which have the strongest impacts on how U.S. institutions will engage abroad. Through discussions, attendees will explore perspectives and experiences interacting with U.S. higher education institutions, examples of successful and less-than-successful collaborations, and develop an understanding of what makes for successful engagement and interactions. is past President and Chair of the Board of Directors of NAFSA, as well as past President of AIEA. He was Vice President for Global Engagement and Strategic Projects (2006-2009) and Dean of International Studies and Programs (1995-2005) both at Michigan State University where he currently serves as Professor of Criminal Justice. He is a recognized scholar in judicial and court systems and in international education. is Director of Academic Affairs for INTO University Partnerships—North America. She has led the international efforts of four large universities, most recently as Assistant Provost for International Affairs at the University of Pennsylvania. She is a past president of AIEA; served as chair of NAFSA’s International Education Leadership Knowledge Community; chaired the NAFSA Task Force on Comprehensive Internationalization, and serves as a NAFSA Senior Fellow for Comprehensive Internationalization. In 2009, she was honored by AIEA with the Charles Klasek Award for Outstanding Contributions to International Education. is an Associate Professor at the University of South Australia. Her research links theory and practice in the internationalization of higher education. She is an Australian Teaching Fellow, Visiting Professor at Leeds Metropolitan University, a member of the Scientific Committee of the Centre for Higher Education Internationalization at the Universita Cattolica del Sacre Cuore in Milan and co-editor, with Hans de Wit, of the Journal of Studies in International Education. Erasmus for All is the new €19 billion program of the European Union for education, training, youth and sport. It will start in 2014 and will significantly increase the funds allocated for the development of knowledge and skills. In the first part of the workshop we will discuss the impact and possibilities for cooperation with the USA. Learning opportunities for individuals, both within the EU and beyond, including: study and training, traineeships, teaching and professional development and non-formal youth activities such as volunteering. Erasmus for All will provide opportunities for learning abroad for up to 5 million people across all education and training sectors. Europeans will have the option to study, train or teach at higher education institutions anywhere in the world, and non-European students and staff will have more opportunities to study, teach and learn in Europe. Extending the program beyond the EU's borders will increase the attractiveness of European higher education and at the same time support the development of higher education elsewhere in the world. Institutional cooperation between educational institutions, youth organizations, businesses, local and regional authorities and NGOs, to encourage the development and implementation of innovative practices in education, training and youth activities, and to promote employability, creativity and entrepreneurship. Support for policy reform in Member States and cooperation with non-EU countries, with a focus on strengthening the evidence-base for policymaking and exchange of good practices. Support will include the implementation of EU transparency tools, cross-country studies and support for specific policy agendas such as the Bologna (higher education) and Copenhagen (vocational education and training) processes. is International Strategist at Tilburg University in the Netherlands. Previously, he set up the International Office at Tilburg University in 2005 and acted as Director until mid-2010, when he became elected as Vice President of the European Association for International Education (EAIE). Hans-Georg is a frequent presenter at institutions and conferences around the world and is also a senior EAIE-Trainer. His area of specialisation concerns International Strategy and Management in Higher Education, Leading and Managing an International Operations, Projects and Partnerships. He was member of the ISEP Council of Advisors in Washington DC from 2002-2006.He is currently Chair of the Editorial Board of EAIE’s Internationalization of European Higher Education Handbook. Furthermore he is a member of many Advisory Boards in Higher Education and Culture. He holds a MA in Development Economics from Tilburg University, the Netherlands. Since September 2012 Hans-Georg is President of the European Association for International Education. has worked for the European Commission for 15 years. Firstly in the Directorate General for Research from 1997-2010 managing medical research programs, then in Education and Culture where is currently responsible for co-operation with industrialized countries. He is a medical researcher by training, getting his PhD in neuroscience in 1994 from the University of Bath, UK. This half-day workshop is intended to help the SIO working at a small, undergraduate institution to strategize ways to move the institution beyond internationalization as synonymous with study abroad and international student enrollments to a more comprehensive approach. Such institutions often lack the research agendas that drive internationalization at larger institutions with graduate programs and may also have limited resources in terms of staffing and finances. Yet their smaller scale, focus on teaching, and philosophy of building intensive communities of learning provide other, very distinctive assets for internationalization. Presenters with experience at NAFSA Paul Simon Award winning institutions will guide participants through the process of planning innovative, far-reaching programs of internationalization at small colleges. Participants in the workshop will begin by identifying goals and objectives for internationalization at their institutions. From there, they will proceed to map their institutions’ existing assets (on campus and beyond) for internationalization, identify needs and obstacles, and discuss ways to deploy the assets to address these and move forward. They will then develop the initial contours of a three to five year internationalization plan, work in more depth on one activity in the plan they hope to implement in the coming year, and identify the desired output and outcomes of the activity. Participants will present their plans at the end of the workshop for critique by the other participants and workshop facilitators. This workshop will further the AIEA conference themes of facilitating change by applying imagination and focusing on the leadership role. is Director of International Education at Beloit College, where her work has focused on comprehensive internationalization. Her publications include Integrating Study Abroad into the Curriculum: Theory and Practice Across the Disciplines, co-edited with Kiran Cunningham, and, with Bette Leask, a chapter on “The Internationalization of the Curriculum” in the SAGE Handbook of International Higher Education. She is a member of AIEA’s Executive Committee as well as its Editorial Board. has devoted her career to small institutions, beginning with attending Rhodes College as an undergraduate. She was first a German professor at the (public liberal arts) University of Minnesota, Morris, then Director of International and Off-Campus Study at the College of Wooster. Now Dean of International Education at Juniata College, she was one of the first AIEA Presidential Fellows in fall 2009, and spent 2010-2011 as an ACE Fellow at Manhattanville College. is Senior Advisor for Internationalization at Bryn Mawr College. Previously, she served as Associate Vice Chancellor for International Affairs at Indiana University-Purdue University Indianapolis, focusing on campus internationalization around a philosophy of international dialogue and collaboration. She has published four books and over 50 articles on international partnerships, international service-learning, and the anthropology of modern Greece. In recent years, Africa has experienced an economic and political resurgence; significant demographic developments and innovations in technology. Today, seventy percent of the fastest growing economies are in Africa (1). The benefits of growth appear to be reaching many of Africa’s people. Poverty is falling and there is evidence of a growing middle class. About 90 million Africa households had joined the consuming class by 2011, which is an increase of 31 million households in barely over a decade (2). In addition, Africa is now the world’s youngest continent with sixty-two percent of the population under the age of 25 (3). Africa is now the second largest mobile phone market in the world with over 600 million subscribers (4). And many sources acknowledge that Africa is leading the way in mobile technology innovations such as mobile banking, internet connectivity and interaction with social media. Education, especially tertiary education, will play a major role in sustaining and expanding the positive trends on the continent. However, given the size of the youth explosion many African countries currently lack the financial and human resources to provide quality education to the increasing demands for tertiary education and skills development. Do these constraints present opportunities for U.S. higher education institutions? If done properly, the answer is yes. EducationUSA Regional Director for east and southern Africa, is responsible for developing and training EducationUSA Advisers in 21 African countries. She was previously Marketing and Communications Directors at both Wits Business School and McDonald’s South Africa. 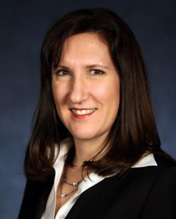 Priester is currently a Women’s Private Equity Fund trustee. She was previously the Businesswomen’s Association (BWA) Johannesburg branch Chair; and CAF Southern Africa board member. Priester holds a MBA from University of Chicago Booth School of Business. has served as Director of the Office of International Students and Scholars (OISS) at Yale University since 1999, providing services to more than 4500 international students, researchers, faculty, staff and their dependents Before coming to Yale, Ms. Kuhlman was Associate Director for the Office of International Programs at the University of Pennsylvania. She is the recipient of an international education Fulbright award to Korea and several other travel awards to Asia and southern Africa. is Assistant Vice President of Campus Life and Director of International Student and Scholar Services at American University where she oversees all operations related to international and intercultural programs, services and student engagement in the Office of Campus Life. She advises university leadership on campus internationalization, issues of inclusion, diversity and equity. Dr. Aw is on the NAFSA board of directors. She received her bachelors, masters and PhD. Degrees from American University. is Dean of International Studies and Programs at Michigan State University. He has responsibility for international programming efforts including: catalyzing and facilitating multi-disciplinary, multi-college international research and project collaborations; and developing and sustaining strategic partnerships with institutions abroad that positively impact critical local, national and global issues. Dr. Riedinger earned a B.A. at Dartmouth College, a J.D. at the University of Washington, and an M.A. and Ph.D. at Princeton University. is the Director of the Office for International Education at Nelson Mandela Metropolitan University in Port Elizabeth, South Africa. He has held this position since July 2000 and was responsible for the development of the Office for International Education. Dr. Jooste also serves on the Executive Committee of the International Education Association of South Africa. He received his Ph.D. from the University of the Free State, a master’s degree from Rand Afrikaans University. Become a future sponsor at the AIEA Annual Conference and raise your visibility with senior-level leaders in the international education field! 2012 Sponsors included ELS Educational Services, Inc. (Platinum), Group of Eight - Australia (Platinum), i-graduate (Platinum), IDP Education (Platinum), Universita Cattolica del Sacro Cuore, QS Stars, BMI, CIEE, iNext, Lorenzo de' Medici Italian International Institute, HTH Worldwide, Terra Dotta, World Education Services, Webster University, EIKEN, and Knowledge Exchange Institute. To become a future sponsor and for more information, please contact [email protected]. Advertising Information: Full-page ads are also available in the conference program (which will stay online for the next year). Please contact [email protected] as soon as possible if you are interested in placing an ad in the conference program. Thank you for considering the opportunity to exhibit at the AIEA Conference. Several hundred senior-level leaders in international education from across the US and the world will participate in this conference. These leaders and professionals recognize the benefits of networking with organizations in the promotion of international education on their campuses. Exhibitors have the unique opportunity to share information about their organizations with these senior-level leaders and key decision makers. All conference breaks will be held in the exhibit area to ensure quality interaction time. AIEA limits the number of exhibitors in order to maximize exhibitors' time with conference participants. Exhibitor spaces for the 2013 AIEA Conference have all been filled. If you would like to be notified next summer about exhibit opportunities for the 2014 meeting, please Click on the link below to complete the Exhibitor Registration Form. Please note that space only opens up if any current exhibitors do not return. Please leave exhibits up through 12 noon on Wednesday, Feb. 20. New for 2013! Extended exhibitor hours! AIEA's Exhibition Hall now opens on Monday, Feb 18. Exhibitor Fee includes exhibit table and two chairs for one exhibitor with full conference registration. A discount of five percent (5%) off the lowest applicable published airfare is available to conference participants who travel February 12-25, 2013 to New Orleans, Louisiana with American Airlines. By phone: 1-800-433-1790 from anywhere in the US or Canada. The 5% discount can be booked online (www.aa.com) ONLY for American Airlines and American Eagle flights. Itineraries involving any oneworld or codeshare partner airline must be booked through our Meeting Services Department at 1-800-433-1790 if calling from the US and Canada. International attendees should call their local American Airlines reservations number. A Res service charge of $25.00 USD per ticket will apply for tickets purchased through American Airlines Reservations, subject to change. For airport purchase the service charge is $35.00 USD per ticket, subject to change. If purchase will be outside the US50/Canada, ticketing charge varies and will be in the currency of the country of purchase. All checked, excess, oversized, and/or overweight baggage and equipment charges apply. Certain aircraft limitations may apply. Box/Baggage embargoes may apply. Please refer to www.aa.com/baggage for current baggage allowance and charges information. For a discount on rental cars, call Avis at 1-800-331-1600 and refer to AWD Discount #D256959, or go to www.avis.com. For personal assistance, contact Ray Walker at [email protected] or 1-800-525-7537 ext. 31303.